This tutorial will help you build your own integration with WhatsHelp. You can configure WhatsHelp to be immediately notified about particular events. Such a notification is called a webhook – it’s just a simple HTTPS POST request that WhatsHelp sends to your server when a particular event occurs. To know more about how webhooks may be used, please have a look at the article How to integrate WhatsHelp with CRM or HelpDesk. At the moment a WhatsHelp account may have only one webhook which subscribed by default on two events: user_profile_viewed and conversation_closed. 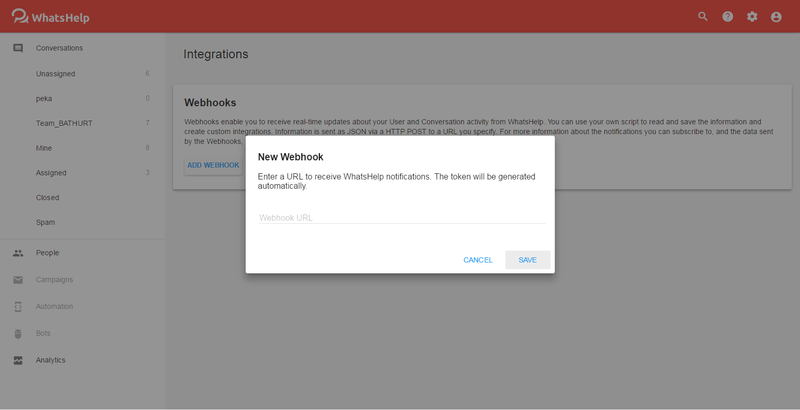 A webhook subscription can be configured in the "Webhooks" section of your dashboard. Only admins can add, edit or delete webhooks. We support HTTPS subscription URLs to protect notifications. 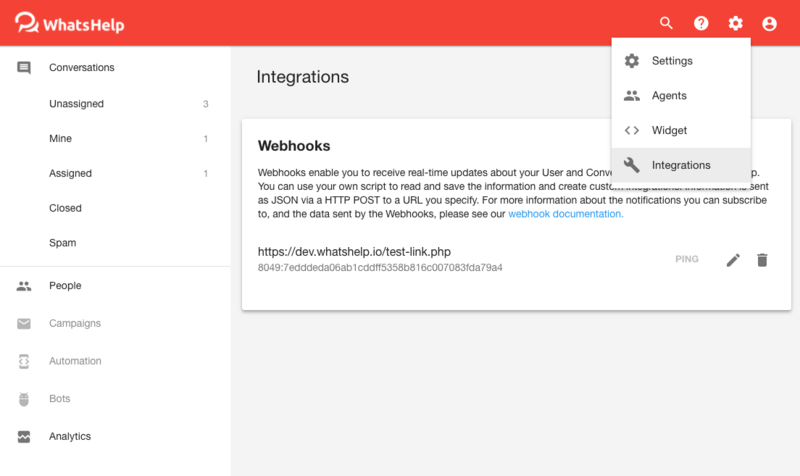 Clicking «Add webhook» will show a form for creating the webhook. Enter the webhook URL, save it and we will automatically generate a token for this webhook. Webhook with specified URL and generated token would be shown in the list of webhooks on the page. Token is required for creating a signature of request, Each callback will contain a signature on the JSON passed to the callback. The signature is HMAC with SHA256 that will use the generated token as the key and the JSON as the value. The result will be passed as HTTP Header X-Wh-Sign so the receiver can determine the origin of the message. Each webhook is a HTTPS POST request made to the URL that you provide in the Integrations section of your account. The request's POST body contains webhook information in JSON format. event – tells you the event that triggered the webhook. Possible values: user_profile_viewed, conversation_closed. event_timestamp – time of the event that triggered the callback. additional information – information related to a specific event type. Please read the Webhook event types section below. When your server receives a webhook from WhatsHelp, it should respond with HTTP 200 status code. Otherwise, WhatsHelp will retry sending the webhook to your service for a number of times unless it receives the correct HTTP 200 status code (Soon). Received field would be shown in the user profile in WhatsHelp (see How to integrate WhatsHelp with CRM or HelpDesk). If your server does not respond in this format, his response will be ignored.